Where have all the menhaden gone? 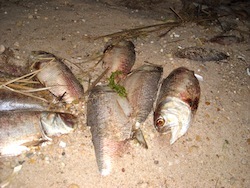 Just five years ago, the shores of the Peconic Bays were littered with the carcasses of dead menhaden, driven up on to the beaches by swarms of hungry bluefish running in late spring. Fishermen ran to the shores to pack the small fish into coolers to use as bait, while parents kept their children away from the stench at the shorelines, waiting for weeks until the fish were cleaned up. The fishermen called them “trash fish” and the smell could certainly have passed for that of a garbage dump. This year, however, menhaden, known colloquially as bunker, are few and far between, leading environmentalists to worry that we’re in danger of losing a crucial link in the ecosystem of the bays. Menhaden serve both as food for commercially caught species and as a vacuum cleaner for the bays, filter feeding out algae that would otherwise bloom out of control. The Peconic Bays had been full of menhaden since before European settlers landed on these shores, and Native Americans taught the first settlers here to use the small, oily fish for food as well as fertilizer for corn. Purse seine boats, which would encircle schools of menhaden with a net that was slowly clutched shut around the fish, plied the bays for generations, though few people today would consider eating menhaden. Today, the fish are used primarily for livestock meal, pet food, bait and fertilizer and for cosmetics and Omega 3 fish oil supplements, which have become a major health food fad. There had never been catch limits on Atlantic menhaden until last December, when federal regulators imposed a 20 percent reduction on the amount of the fish that can be caught in the Atlantic States fishery until at least 2014, when a new assessment of the menhaden stock is expected. The efforts are supported by fishermen who fish for larger species, particularly striped bass, which rely on menhaden as a food source. Mr. Berson isn’t alone on the East End in believing more must be done to protect fish like the menhaden. The North Fork Environmental Council, based in Mattituck, announced last week that they have joined Herring Alliance, a conservation group looking to protect menhaden and other baitfish. The biggest skeptic in the fisheries world has been Omega Protein, the company that runs most of the world’s menhaden fishery. Omega Protein has been banned from fishing in state waters surrounding 13 of the 15 Atlantic states, though they can still fish in outlying federal waters. Schools of bunker were chased by bluefish onto the shores of Flanders Bay in May, 2008. This year, they have been scarce in the bays. In addition to menhaden’s importance as a baitfish, it also serves a crucial role in filtering algae out of the East End’s bays. Protecting bait fish like the Moss Bunker and other species lower on the food chain is essential to an overall healthy ecosystem. BTW; I was snorkeling last week just west of Goldsmith’s Inlet on LI sound and observed some schools of young menhaden just off the beach. I hope this is a good sign. I know the Inlet is important for young Winter Flounder maybe it’s important for the Bunker as well. That’s good news, Rick! Thanks! Beth , I was sorry to see you perpetuate the myth that menhaden improve water quality. The science says otherwise. Check out: Friedland et al 2011, Journal of Coastal Research 27(6): 1148-1156. In summary, they say: “…these results suggest that adult menhaden play a minimal role in providing ecosystem filtration and may actually promote primary production [your algae blooms] through the removal of zooplankton grazers and the excretion of nutrients”. Hi, Joe, thank you for your note. From what I’ve seen, this is the only study out there that suggests such a thing. I can only seem to access the abstract, however, and I would be interested to see what the results were for the juvenile menhaden. What’s your take on Sara Gottlieb’s work? I worked as a marketing manager @ Rust-Oleum in the old days, before water-based formulations became prominent even in the industrial coatings sector. Menhaden oil was still touted then as the key ingredient in our premier rust-preventive primer–the product on which the company was built. Special customers received a gift book: “Born O’ the Sea,” a biography of “Captain Bob” Fergusson which was self-published, but reasonably competent & informative. Though my copy’s long lost, I recall that the details of how the Captain discovered the protective qualities of fish oil–& persevered until he had a paint that worked, but didn’t stink–were fascinating. Hi Larry, Fish oil without stink is like a day without sunshine. That’s no BUNK-ER CHUM. Oops, I get a PU out of a PUN. I have fished for striped bass in many of the rivers in Virginia that flow into the Chesapeake Bay. I started fishing when I was 17 years old and will be 75 in August. I know that if the menhaden are over netted in the bay and the food supply for the striped bass and other fish that feed on them will leave the Bay. They will seek other areas where their food supply will supply their need. We must get our state government to lower the quota of the amount of menhaden that may be netted. Is there an organization I can join that is working toward that goal. The ASMFC management is corrupted by a single corporation in Virginia taking near 85% of menhaden landed. They spread lots of money around. They employ former NMFS career menhaden managers when they retire to lobby and attend tech. And assessment committees. The stock is managed with a mathematical model which attempts badly to predict what’s happening in the Atlantic Ocean in regards to the stock. The model can be manipulated and the results predetermined by adjusting inputs until the output is what they are looking for. The stock is now fished down to 1%’of its unfished biomass. Bio 101 = no prey species- =no predators. We are exporting the ground up menhaden to China so they can feed their Telapia ponds on the cheap. We are exporting our food web along the east coast for pennies. This is a catastrophic situation and our menhaden dependent predators are disappearing.